PuzzleMad: Parity is to be understood not feared! OMG! A giant cube and a double parity! Before you all switch off because it's a twisty post, there's a special little treat at the end of this post and DON'T scroll straight there! I saw you! Yes! I am sorry to all you non-twisty puzzlers but here's another post about them. My aim really is to try and demystify them and encourage you all to have a go. I agree, the learning curve can be steep but, we are all puzzlers here and should enjoy trying something new and to stretch our solving skills! Today I am going to talk about the dreaded "PARITY" problem and show you that it should not be feared. In fact, it needs to be understood and even enjoyed for the added dimension that it adds to your puzzling. In the process, I will show you some new cubes that I bought from a relatively new shop: cubezz.com has sort of burst on the scene with some really good prices and excellent service - go and have a look. At the top of the article there is a special view of a fantastic new cube on the market. 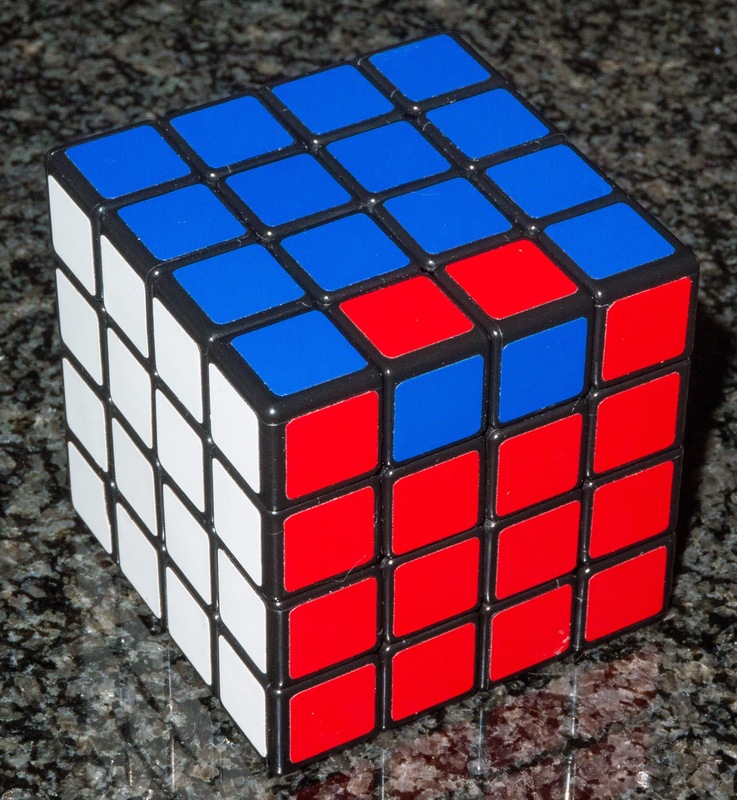 It is the Shengshou 10x10x10 cube and despite its phenomenal complexity it is smooth as butter and an absolute dream to scramble and solve. I took it to work a few times and everyone was absolutely fascinated by it! It looks amazing either solved or (some would say it looks better) scrambled. 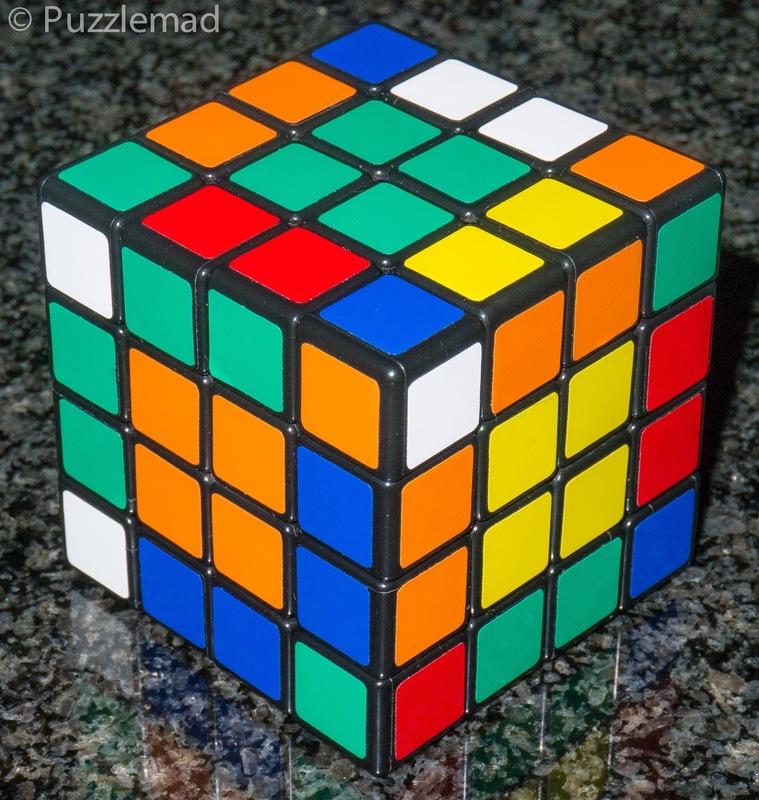 I have solved it quite a few times and apart from the hand ache caused by it's sheer size and weight it is wonderful - currently it is my favourite cubic puzzle. 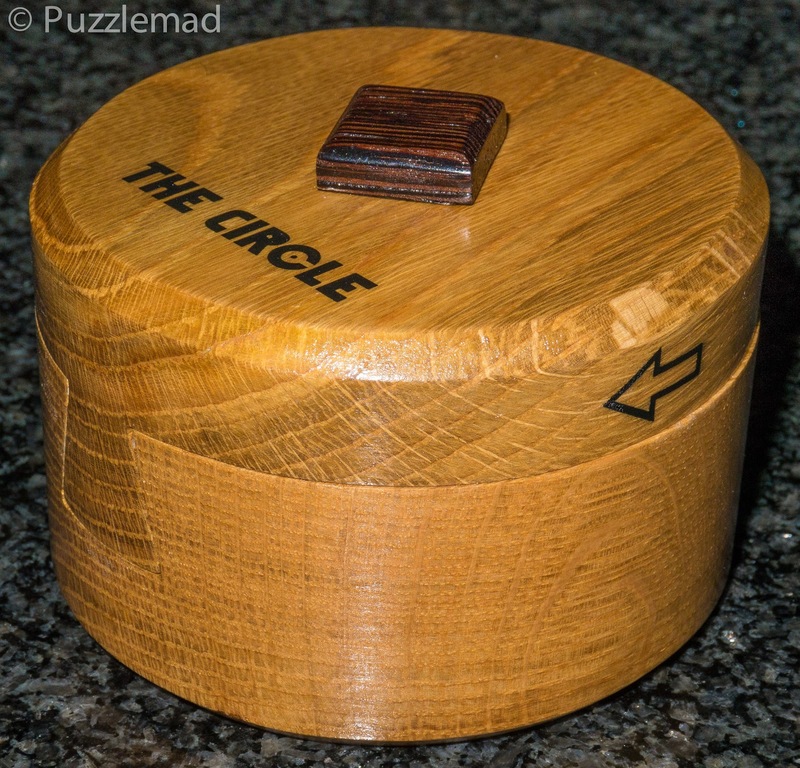 This puzzle is what is known as a "knock off" and so not listed on most websites so if you wish to buy it from cubez then just contact them and ask (their price is the best by a very large margin). The "special view" in the top picture is of the cube exhibiting not just one, but two parities and it is really not to be feared at all. So having frightened you to death, what is a parity and more importantly, why does it occur? At the beginning of last year I posted about a classification of cuboids and then recently republished it in print for the CFF journal and in those articles I talk about several different types of parity. I really would hope that most of you puzzlers at least own a 3x3 cube and have made some attempt at solving it! After all if you are puzzlers then you should not just ignore such an important section of our hobby completely - the founding model should be in every collection. For those of you who have done the 3x3 there is NO parity and you should be very pleased with yourself that you can do what the vast majority of the world's population cannot! 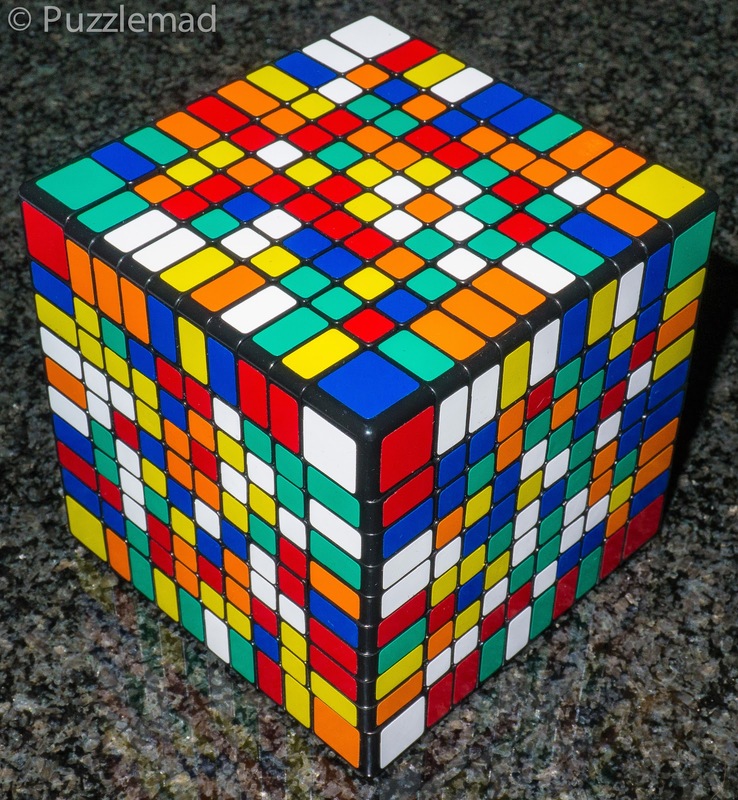 You see a parity in an ordinary cube when you move up a difficulty level and move to the 4x4 and in fact every even order cube exhibits them. They are a direct result of the approach that most of us take to solving these bigger cubes. Many would think that the correct way to solve a 4x4 or higher (right up to 10x10) would be to just do it layer by layer as many do for the 3x3. I have solved everything up to 7x7 in that manner and whilst fun it is VERY arduous and strangely introduces a new parity! What most people do is they reduce the bigger cubes to a very odd shaped 3x3 - that is you group all the centres together by colour, then you recreate the edges (paying no attention to where they go) e.g. just move all the Red-Blue edge pieces into one big edge and this effectively leaves one with a oddly proportioned 3x3 with giant centre pieces and edges and small single cube corners. Now it is this very reduction technique that causes the issue - when you are reforming your double piece edges (aka 'dedges') you cannot tell by looking at it whether the a R-B edge piece should be on the right of the pair or on the left. This possibility of getting them the wrong way around is there for every single edge piece pair. The end result is that you may have what looks like a scrambled 3x3 (albeit a funny shaped one) but with one (or 2) of the edges in a conformation that a standard 3x3 cannot reach. You cannot tell this by looking at it! You only find out when you reach the final part of the solution process when you may find one of two different "impossible" situations. Or, horror of horrors, as in the very first picture you may have both! These are absolutely impossible on a 3x3! So what can you do about it? Having understood how it comes about then it should be relatively straight forward to repair the issue. We know that in one case one of the edges has been reformed with a single edge reformed the wrong way around - this causes the single edge flip parity above. So the easiest thing to do is memorise a huge long algorithm which will flip the edge - after an enormous amount of time I have finally memorised one of these algorithms. SuperAntonioVivaldi calls it the RedBull algorithm. r2 B2 U2 l U2 r' U2 r U2 F2 r F2 l' B2 l2 OMG!!!! It is actually not too bad to memorise but I barely remember my name sometimes and so struggled with it! Effectively it dismantles the edge and flips it over by swapping the 2 pieces. For a long time in my puzzle solving I could not remember the algorithm and so I went to first principles and used a technique from Rline's site in which he simply dismantled the edge and put it together again. Then you are ready to solve the 3x3 again. When you first start out with twisty puzzles you may do what I did. Learn a 3x3 and then try a 4x4 and get so horrified that you stick to odd order cubes for a while - BUT once you understand the cause then you seek out puzzles that exhibit it to add an extra dimension - you need to understand why they occur! "Can this awful parity thing be avoided completely?" Yes - I'm hearing voices again! It is indeed possible by solving it in a totally different way. I mentioned solving them layer by layer - but whilst this is a fun diversion, it doesn't actually prevent it because you are still potentially left with the edge pieces in the wrong way around when you get to the last layer. 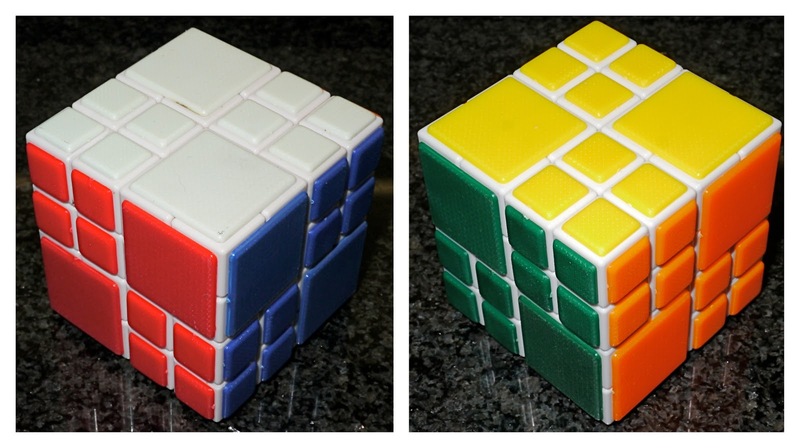 The only way to solve a 4x4 without these parities is to avoid reducing the edges at all! This means that an approach of reducing from an even to an odd order puzzle doesn't work and another idea is needed. How about reducing a 4x4 to a 2x2? This sounds awful but the solution is based on the solution to something that I originally thought was horrific - The Bandaged AI cube. This is a 4x4 with four of the 2x2 blocks bandaged together - this means that the remaining 2x2 corner blocks need to be reformed and then solved as a 2x2 - This is a hugely fun puzzle and very challenging. 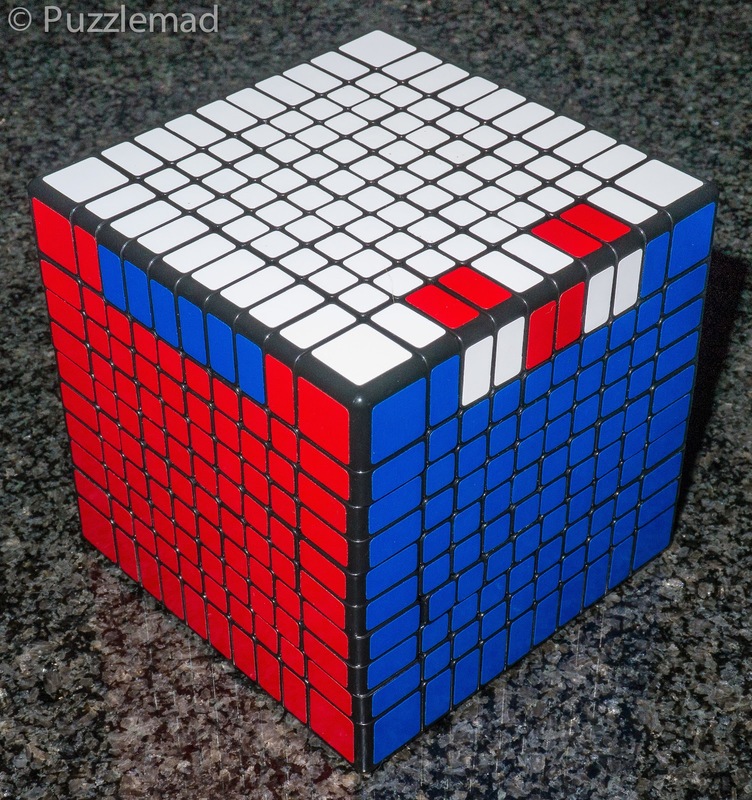 Can it be done with bigger cubes? I suspect it can but have not tested it - SuperAntonioVivaldi has challenged his viewers to try it with a 6x6 (unfortunately I don't have one and so cannot try it just now. Maybe soon? 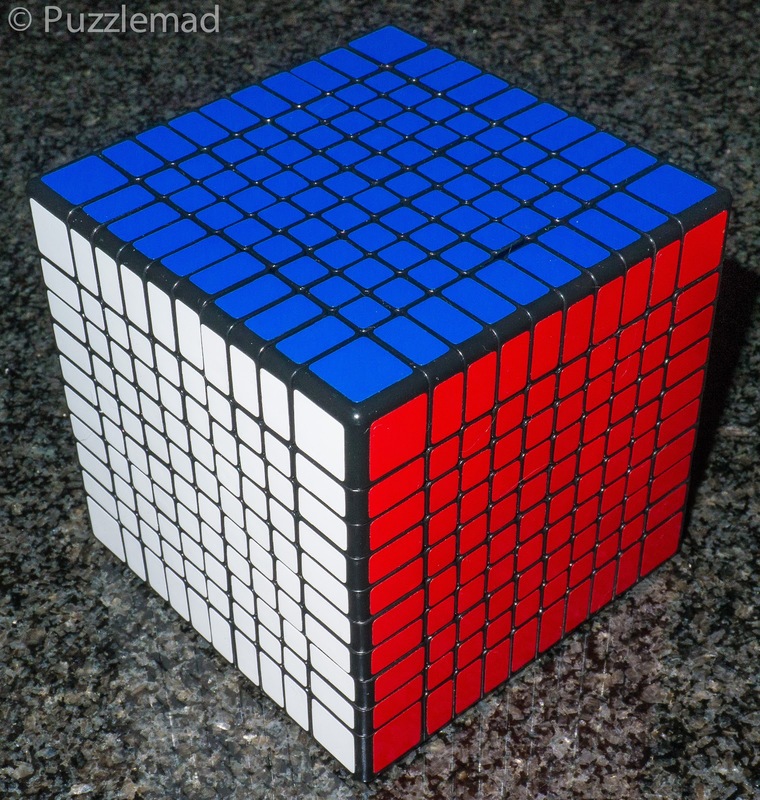 So hopefully you will be motivated to go out and buy a 4x4 - they are very cheap at cubezz.com or can be bought from general puzzle stores like Puzzle Master. If you need something really impressive and special then definitely go to Cubez and ask for the 10x10 - you really will not be disappointed - I love it!! In a couple of weeks there will be a part 2 of this in which I discuss other parities that are possible in different puzzles and why they occur. Hopefully this will encourage you to try something new and realise that it is not something to be feared and all is just an extension of basic ideas. Being a 'bear of very little brains' I really have no way to memorise lots of algorithms - for me the aim is to understand what is going on and work my way through by deduction and using only very few ideas. Those of you who are friends with me on Facebook may have spotted something when I posted a new picture of the awful mess I had turned my study into! 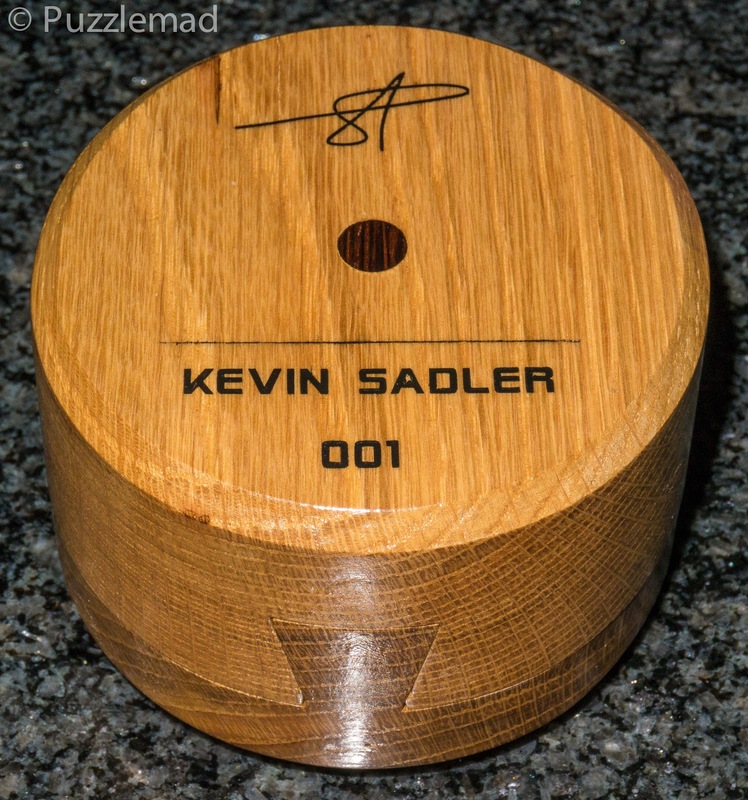 This beauty is made of American white oak and ebony and I think the knob on top must be Wenge. It is a really solid weight and finished beautifully. When you roll it there seems to be metal things inside. Shane has told me that there is nothing in common in the solution with that of the block and I can only say sheepishly that the first step took me several hours to find. The next step continues to elude me and I have spent a further 5-10 hours trying out various ideas. I suspect I am over-thinking it but it is certainly keeping me occupied. I am in awe at his skills! He works in wood and metal - there was even a two piece acrylic stand that he'd made for it. Wow!!! Thank you Shane - your skills and generosity leave me speechless with delight and very little leaves me speechless! More information on this later. My goodness, the Giant Cube, how do you even turn the thing?? It is enormous and does get tiring to turn, but it is just so smooth and looks so awesome that I could not resist it. It is my favourite cubic puzzle just now! 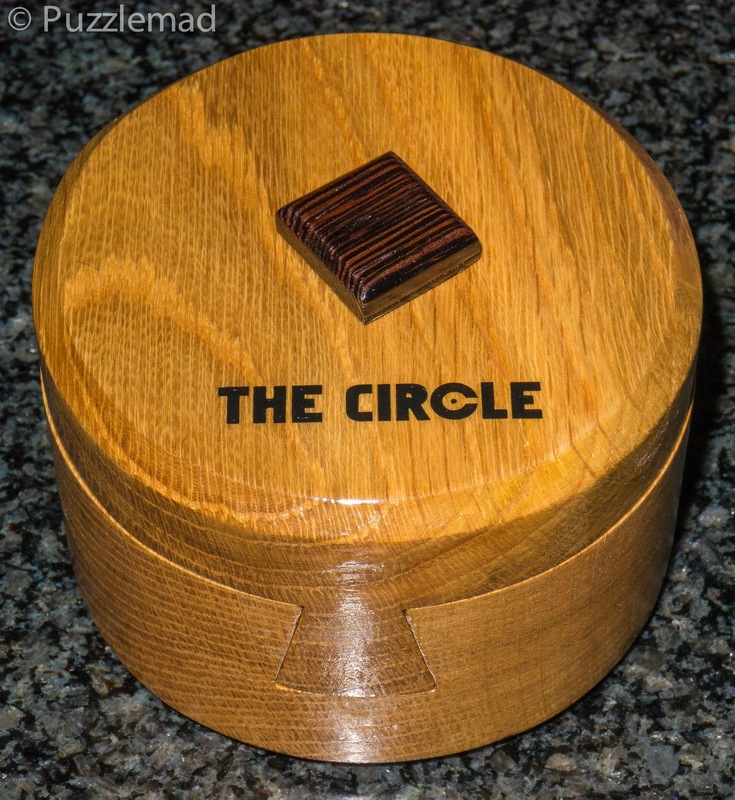 Is Shane going to start selling the Circle? Looks very nice! Mine is version 1 which is effectively a prototype. Shane has, I think, made 4 more but not sent them all out or determined what to do with them. He has no plans to put them into generalised production because he makes them all himself by hand! I haven't got a void cube but I think I will make one from the CubeTwist bandaging kit. Rather than learn an algorithm the best thing is to understand the cause of the parity and move to repair it from 1st principles. I suspect that the issue is caused by the equatorial centres being positioned 1 space away from where they should be. So I suspect that sliding the equator clockwise by one and resolving the edges will fix it. What, no Void Cube? Around here you can buy them at Target for $12. Rik mentioned it in CFF 83, November 2010, but it came from youtube. 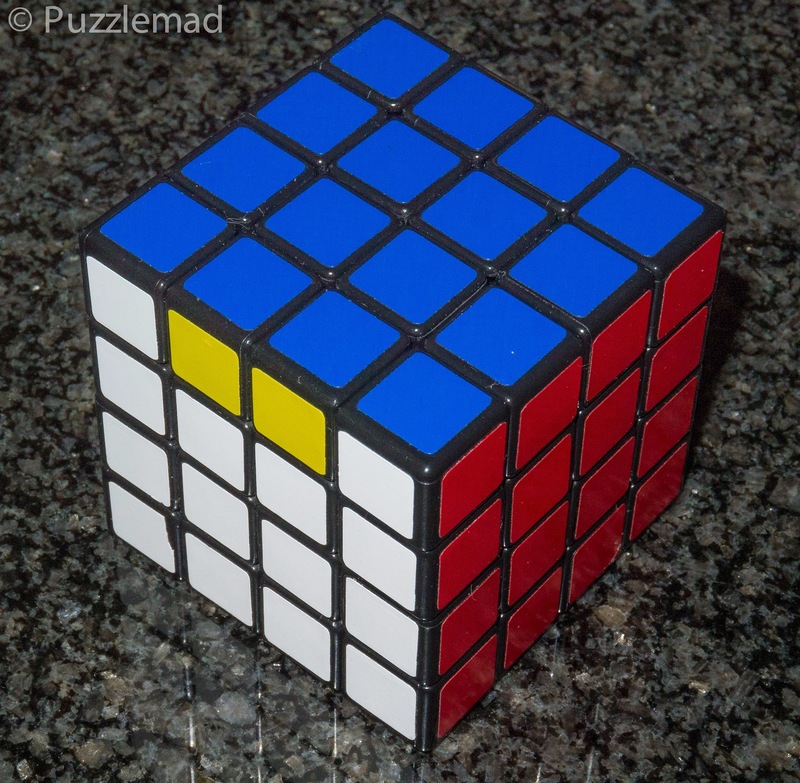 "r2 B2 U2 l U2 r' U2 r U2 F2 r F2 l' B2 [r]2"
The l2 being swapped to r2 at the end. Oops! You're absolutely correct - I'll adjust it when I get a moment! Wouldn't what be the same? I'm determined to figure out parity on my own, I hate learning others algs as I feel doing so ruins the puzzle aspect of twisty puzzles. The link to "Rhines" site seems to be dead. Do you have any others that may help with figuring out parity fixing algs on my own? Unfortunately there has been no one to replace Rline. SuperAntonioVivaldi has some good videos but nothing helps explain parity quite as well. It is probably worth surfing around the Twisty Puzzles forum. They may have done old posts and also may be able to point you to good explanatory videos elsewhere. Four Deliveries in one week! Is that bad? Paperclip and how about a twisty for the weekend?